You’ll now have to go way back to Jamie Gold’s 2006 victory to find a larger Main Event field than the one created at the 2018 World Series of Poker. Over the past three days a staggering 7,874 players have taken their shot in the $10,000 pinnacle of the poker calendar, making this the second largest Main Event in history. Here’s all the news from Day 1C on July 4. Monday’s Day 1A got 925 runners. Tuesday’s Day 1B attracted 2,378 more. And now that play is over on Wednesday’s Day 1C, it’s been revealed that a massive 4,571 players came to play. That amount not only creates the largest single flight of poker in WSOP history, but makes 2018 the second largest Main Event of all time, too. The total entries show a 10% increase compared with last year, and have created a $74,015,600 prize pool. There’s $8,800,000 up top for the eventual champ, and the Rio was absolutely rammed today full of hopefuls. After five two-hour levels though, roughly 3,500 made it through. Samuel Touil is believed to be the Day 1C chip leader with 352,800, although with so many players there’s a chance a bigger stack may have slipped through the cracks. If Touil is indeed the chip leader, he’ll be the overall boss moving into the Day 2 flights. Yep, Day 2 is still so big that it’s needing to be split up. So, survivors from 1A and 1B will play tomorrow (Thursday 5th), while 1C survivors will return on Friday (July 6). Who Made It Through Today? Some of the biggest names in all of poker sat down to play today, and a bunch of them made it through when all was said and done. 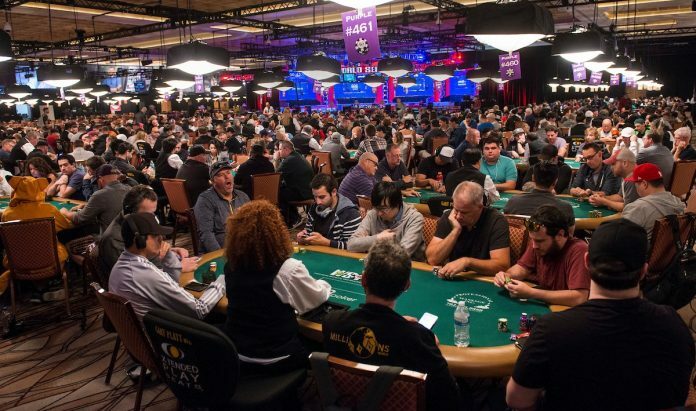 Two notables in particular returned to the WSOP this year after taking a break from the spotlight. High Stakes legends Phil Ivey and Patrik Antonius were in action, with Ivey turning his 50,000 starting stack into 92,300, and Antonius quadrupling his up to 208,700. Former Main Event champions Phil Hellmuth (63,700), Martin Jacobson (38,400), Jonathan Duhamel (17,500), and Joe Cada (16,500) all advanced too. A deep run by any of them would certainly be exciting to follow. Then you’ve got the likes of bracelet winners Loni Harwood (194,200), Jessica Dawley (140,600), Davidi Kitai (104,200), Jake Cody (98,700), David Benyamine (90,400), Liv Boeree (63,400), and Chris ‘moorman1’ Moorman (59,200) to name just a handful of today’s survivors. Of course, not everyone could find a bag at the end of play. Daniel Negreanu was the victim of some bad luck when his pocket jacks were all-in versus pocket tens, only for a ten to hit the board. Chris Moneymaker was another notable to depart. His run was short today after getting all his money in with a flopped set of fives. He was up against the pocket tens overpair, but just like Negreanu, fell victim to a ten on the river. Andrew Moreno, Marcel Luske, Chris Vitch, Jonas Mackoff, John Racener, and Vanessa Selbst are just a few of the other casualties throughout the day. Thursday will see the Main Event continue, with survivors from Day 1A and 1B playing through their Day 2. We’ll also see a bracelet winner though, as the $888 Crazy Eights event returns three-handed. Galen Hall holds the chip lead in that one, making him the favourite for the massive $888,888 first-place prize. A new event also kicks off at 3pm: Event #66: $1,500 No-Limit Hold’em.